Like many of you today, I followed intently the news of the devastating earthquake in Japan. At once, it was a fascinating observation of the unforgiving power of nature and a somber reminder of the frailty of humankind and the preciousness of life. As a Disney blogger, the disaster had added resonance because of the close proximity of the Tokyo Disney Resort to the epicenter. 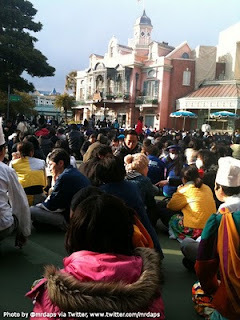 During the day, I passed along news bits here and there via Facebook and Twitter of the status of the Tokyo parks, the guests who were stranded there, and the likelihood of the parks reopening soon. I'm grateful to the entire Disney blog and news community for their generosity in sharing information. 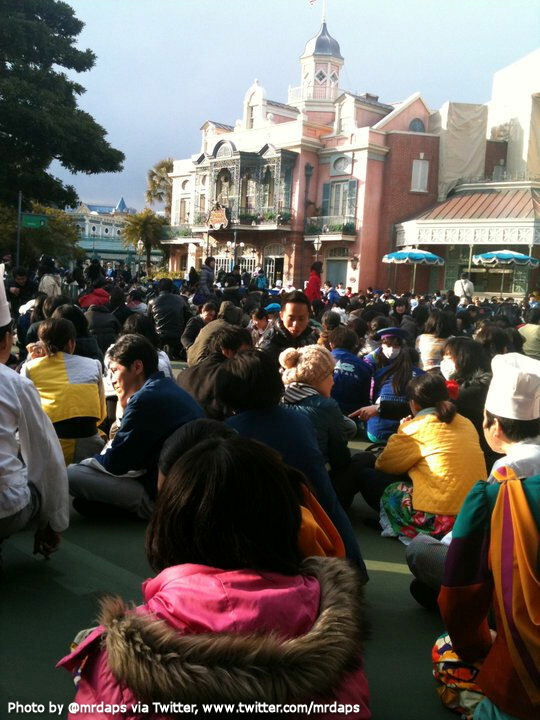 Thousands of people were forced to remain at the parks overnight because of train service cancellations following the earthquake. By all accounts, Disney cast members did everything they could to keep guests as comfortable as possible during the chilly, rainy evening. Rain jackets, plastic bags and hand warmers were given out to help protect people from the elements. A statement from Disney via the Disney Parks Blog noted that there were only minor injuries reported and that the parks sustained minimal damage. It went on to say the "safety of our guests and cast members is always our first concern." As damage assessments continue, Tokyo Disneyland and Tokyo DisneySea will remain closed at least through Saturday. In the grand scheme of things, though, that all seems so trivial. The calmness of the crowd, cast members and videographer belies the destruction that was being unleashed 250 miles to the north. Entire towns and neighborhoods were being flattened by an 8.9 magnitude quake, then swamped by an epically powerful tsunami. The most unforgettable video news footage I saw was of burning houses, ripped from their foundations, being washed out to sea still ablaze. As of this post, over 400 people are confirmed dead from the disaster and that number could reach the thousands. There are further fears that a nuclear reactor at the Fukushima Daiichi power plant, about 160 miles north of Tokyo, could suffer a meltdown. Suddenly, Disneyland being closed this weekend isn't so important. Our hearts are with the people of Japan. Help support recovery efforts by visiting http://american.redcross.org/Earthquake. Thanks Angelica! Welcome to the Mouse Castle!